By: Shawn C Baker on 26/01/2013. Ah, Rick Spears. A couple of years ago, two separate friends on two separate coasts* recommended two different indie books to me at just about the same time. One was a manga-sized book called Black Metal, the other was the traditionally formatted Teenagers From Mars. I read both, Black Metal in the summer and TFM in October, not realizing in the interim that they were by the same author, Rick Spears. Both books are great – very different from one another in some ways, very similar in others. But great all around. Black Metal is a kooky kind of take off on kid black metal fanatics and the idea that, well, what if their hyperbolic, melodramatic imagination-fueled view of the world was real. Teenagers From Mars is a lot heavier. It still retains a very teenage-friendly vibe, and there’s definitely some fun in it, but at its heart it is a story about censorship and bigotry, frustration, outrage and ignorance and the violence they can lead a person (or an entire town) to. It’s characters remind me of people I’ve known – almost to a “T”, but in a very generic way. If that doesn’t make sense to you think about Kyle MacLachlan’s character Jeffrey Beaumont in David Lynch’s Blue Velvet or Christian Slater’s Clarence Worley in True Romance. Both are hyperbolically normal. Likewise with the cast of Teenagers From Mars. And as with any narrative built around believable, likable characters this relatability definitely sharpens the book’s effect. It also makes it quite hard to view the main characters, Macon and Madison, as “bad guys” even though, to some degree, they become just that. Oh okay, they’re not really “bad” guys, like Frank Booth or Drexel in the aforementioned films, but they definitely are guilty of doing things that could have turned out a lot worse for everybody involved, despite having the best of intentions and, really, being morally Right. But life’s one big, jagged area of gray and it’s inside that landscape of ambiguity and uncertainty where most people come of age. And Macon and Madison definitely come of age by story’s end. While reading Teenagers From Mars again recently I was struck at just how important of a book it is in regards to really showcasing the “so much more” that can be done – narratively speaking – with graphic fiction. As such it was a no-brainer to dedicate a TCC to it to try and spread the word to those of you who might not have read the book and help celebrate its merits (of which there are many). I don’t want to give too much away, but as a general wetting of yon appetite let’s say that Teenagers From Mars is about a guy named Macon who lives in a po-dunk town named – of course – Mars. For the purposes of this story the population of said town appears to basically be divided into two categories. On one side we have a population of easily controlled, middle-America types who get their opinions and life lessons from local news broadcasts and church. On the other we have the beer drinking, drug-taking, punk rock and horror movie purveying teenagers. This might sound slightly overwrought as far as characterizations go, but believe me it is not. Growing up in the suburbs of a major Midwestern metropolis I can tell you that this set-up hits pretty close to home in a number of ways. When you’re a teenager in a small town or suburb your interactions are often limited to your peers and local authority figures – which can include ever adult around you all of the time. Macon is not in school (my interrpretation is he’s a year or so out) but he works for the local MallMart. He’s an artist trying to get by. Our story begins when he has an altercation with his boss over something he feels is morally Right and ends up losing his job because of it. It is a MASSIVE compliment to Mr. Spears when I say that during the fallout from this very down-to-Earth inciting incident it is both uncomfortable and wonderful to watch Macon stand up for something he believes in, regardless of how ugly it gets. That something is comic books. From here Macon literally goes back to square one with the ‘bill-paying’ portion of his life. He lets off steam by attending a party where he drinks too much and discusses his passions: comics, music and movies (see why I like this guy so much?). It is at this party that our hero meets his dream girl, Madison. Madison is the quintessential punk rock/goth chick; the kind of girl who can keep her feet planted in both those worlds and yet never take either ethos far enough to become caricatural. She compliments Macon perfectly and together, well together they have one hell of an adventure combating the ignorance of the adults that run the town wrapped so unfortunately around them. 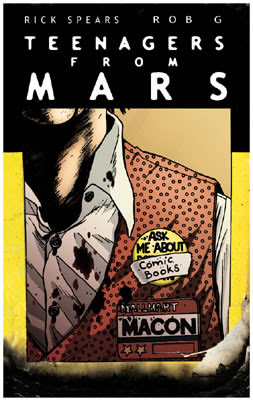 Teenagers From Mars was published in its current collected, trade paperback form by Gigantic Graphic Novels in February of 2005. It is still in print. *well, okay Chicago isn’t really a coast but because everyone in LA refers to it as the East Coast I’ve taken to referring to it as “The Middle Coast”.